This entry was posted in Games and tagged Ayn Rand, Bioshock, boy person friend, dieselpunk, dystopia, first person shooter, steampunk, X-Box. 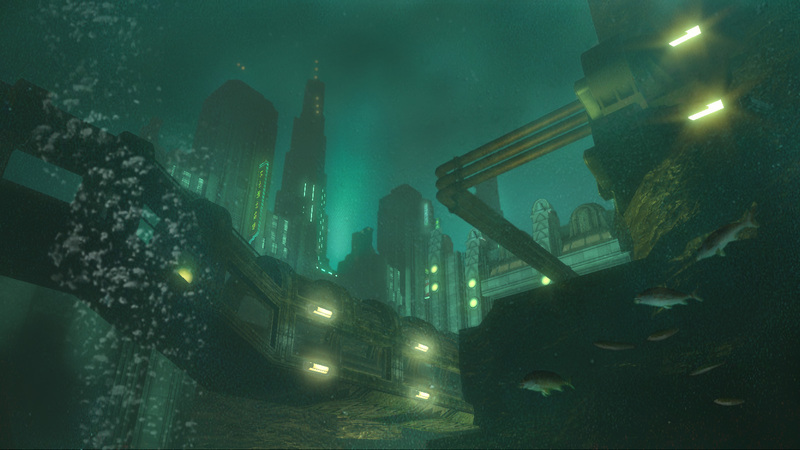 How have you fared in the city of Rapture? Have you finished Bioshock and moved on to Bioshock 2? Hey, Kovac! Because I only hang out with the boy person fiance a few times a week, and because we also devote serious time to BSG and eat dinner over ER, and because he likes to game together and we can only do that with Marvel Ultimate Alliance, and *not least* because he bewails my technique with the camera controller, I haven’t finished Bioshock. The mills of the gods grind slow, but they grind fine. However, the boy person fiance has started playing Fallout 3, and I am very excited to have a go. I think the RPGs are more up my alley. Would you concur? I tend to enjoy RPGs above most other types of games as they tend to have better and more immersive stories. They are often a lot less linear as well so if you like some choice in how your story develops I would definitely recommend them. I would generally recommend to most people that they start with Fallout 1 and 2 before proceeding with Fallout 3. Not because the first two lead directly into the third game but they do give you a lot of background to the game. That and they are just fantastic games. However they are a lot older than FO3 and the visuals aren’t quite as shiny or impressive. The gameplay is also a lot harder and more tactical than what you find in FO3.